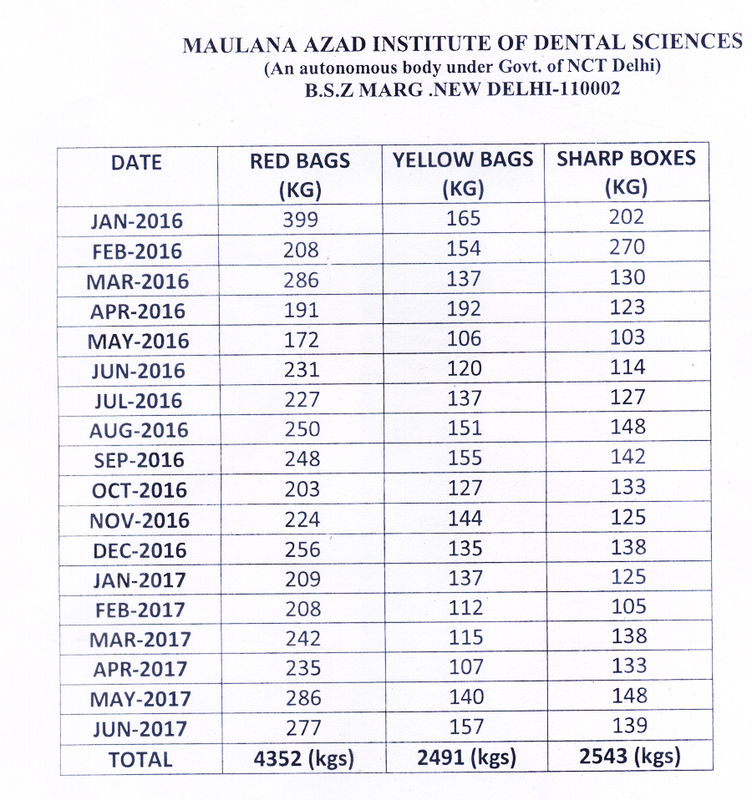 Maulana Azad Institute of Dental Sciences has been meticulously and efficiently managing its Bio-Medical Waste since 2005. Biomedical waste is segregated at source, collected and disposed in accordance with the Bio Medical Waste (Management and Handling) Rules, 1998 as amended in 2016. The institute is authorized by the Delhi Pollution Control Committee to operate a facility for generation, collection, storage and disposal of biomedical waste. The Bio Medical Waste is handed over to common bio medical waste treatment facility M/s SMS water Grace BMW Pvt. Ltd for final disposal. The water effluents are treated at the ETP of GB Pant Hospital, New Delhi. The institute has constituted a Bio Medical Waste Management Committee which conducts training, monitors segregation, collection and disposal of waste and over sees all activities related to waste management. All staff handling Bio Medical Waste is immunized for hepatitis B and Tetanus.